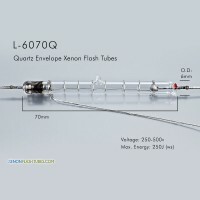 Clear-Fused-Quartz (CFQ) Flash lamps are usually made manually, since they have a much higher fusion temperature. But at the same time results in higher manufacturing costs. The Quartz envelope allows higher Explosion Energy, and in many cases will benefit to a longer lamp lifespan. As a result, a higher Current Density is possible, which helps reducing the lamp's physical dimensions for a given application. Depending on applications, sometimes UV spectrum output is needed. the Quartz made envelope will transmit a wider UV spectrum including UVA, UVB and UVC down to about 220-240nm. 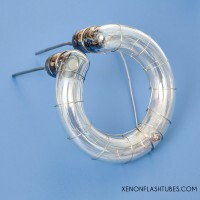 Most of High grade Xenon Flashlamps are made of Quartz, for both air-forced and water cooling methods. 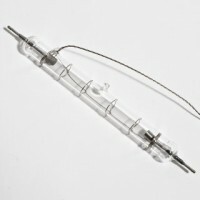 Looking for a specific Quartz Lamp, or need us to manufacture a replacement for an existing lamp ? Please Contact us for details and information.